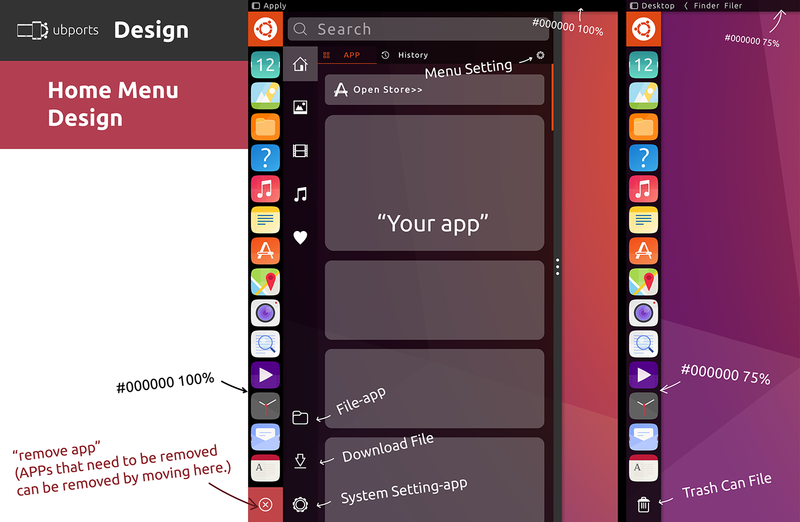 This is my Unity8 Home Menu Design concept. @louies Just tidied it up a bit. Looks pretty! But won't things be too tiny on a 5-6 inch phone? I really don't think we should be trying to turn the Unity 8 app drawer into the same as the Unity 7 dash was, which it looks like your design here is intended to do. Also, adding a secondary vertical panel like this seems excessive. Why do you think we need it there? IMO, there is way too much noise going on in this mockup. @Louies I'm an dinosaur terminal guy, i don't get completely what i'm seeing there... So on the right side its the app drawer with the "home menu" collapsed right? Can you please make two separate pictures for me? What do you mean by "Your app"? The grey boxes should indicate that apps can somehow be grouped together? So I also feel, there are really a lot of controls in here but I appreciate your ideas and suggestions! Lets discuss which maybe are redundant and which of the controls bring real ux improvements. Me personally i really want to see this app grouping feature (instead of sorting the apps alphabetically which i really find horrible ux!). Thanks for creating this mockup. Hey Louies, this looks interesting. Home screen let filters and draw those jsons data.